Have you read any of the Harry Potter Books? Have they warped your fragile little mind? Has Cap'n Wacky? Sounds like something worth discussing on our message board. The Harry Potter books by J.K. Rowling have been wildly popular with kids, and unpopular with religious conservatives and those who like to encourage children to read anything but things they will actually enjoy. 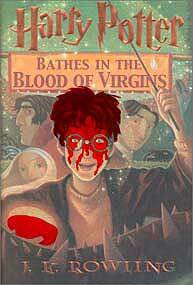 Harry Potter Bathes in the Blood of Virgins. The newest book in the Harry Potter series. Harry and his friends return once again to Mephistopheles' School of Witchcraft and Wizardry to study the use of magic. Harry loves life at the school much more than he does life with his non-magical relatives (or "unbelievers" as they're called by the wizards). However, he realizes that once this year is over, he'll be more than halfway through his schooling. With no idea what to do with his life next, Harry starts to wish there was some way he could stay young forever. Without wanting to give away too much more, let me just say that Harry does find a way, but he also eventually regrets the steep price he must pay to earn that youth. Yes, it's very good. The author keeps you guessing at every turn just what will happen next. Kids will be turning through the 666 pages faster than you've ever seen them read smaller books. Will it make my kids worship Satan? Charming Scottish author J.K. Rowling. A lot of people are worried that portraying wizards and witches in a positive manner will have kids gutting their kitties and howling pagan hymns to the moon, but I don't think you have to worry. Sure, Rowling goes into great detail about how to perform certain spells, but having tried them all, I can assure you that most of them don't really work. Besides, the ingredients are difficult to come by. How often do schoolchildren have the chance to harvest the still-beating heart of an albino weasel? Not too often, I bet. So, relax. Let your kid read the book. Maybe you'll even want to read it yourself. A lot of adults have been, you know. Nothing to be ashamed of. You'll even like it, I bet. In fact, you might start to feel left out if you don't. You will read the book! No one can resist! 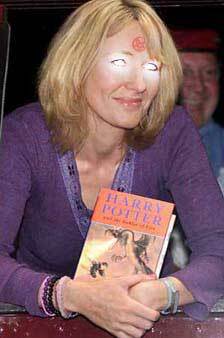 I invoke the names of Azazel and Beelzebub and COMMAND YOU TO READ HARRY POTTER! DEATH TO THE UNBELIEVERS!